The Chicago RV and Camping Show ran from Feb. 13 through Feb. 17 of 2013. Georgia and I visited the show on Saturday. We weren’t shopping for a new RV since we already have a trailer on order but we did want to check out campgrounds and RV accessories. We left with a good 20 pounds on brochures, catalogs and directories. It is a good place to get ideas for trips we might want to take and places to stay. At the Camping World display, we ran into our salesman who told us our trailer had come in and that we could stop in to check it over any time. So, after we left the show, we went over to the camping world lot to have a look at our new traveling home. There were only a couple people manning the store on Saturday since most of the staff was at the RV show but we did find someone to take us out on the lot to find our trailer.We walked all the way around the large lot – in the cold – only to find the trailer right on the end of the shop where we had started. Our new toy is a 2013 Dutchmen Kodiak 241RBSL. We chose this model because it gives us all the things we wanted in a very lightweight package. I listed some of our reasons for looking for a new trailer in an an earlier post. Our two main requirements were a permanent bed so that we wouldn’t have to convert the dinette into a bed at night and more storage space. The Kodiak gives us both of those since it has a front island queen bed and has an amazing amount of storage for a 24 foot unit. The Kodiaks come with most items standard and offer very few options. The ones we did order were 15″ aluminum wheels, a black tank flush, electric tongue jack and an LCD TV. We specifically asked that they leave out the bumper mounted grill since we prefer to use our own. The other request we made – that we thought would be simple but wasn’t – was to NOT install the table in the dinette. We wanted a free standing table but it was not offered as an option. The table that comes with the unit is mounted on two pillars that fit into sockets screwed to the floor. Our first thought was that we could just take out the screws and add our own folding legs to the table top then use a rug to cover the holes in the floor. But then we thought that if we could get the factory to send the table top but not install the legs, we would have a nice looking floor without any screw holes to cover up. It turned out that special requests like that are hard to get through the factory. Our salesman called the regional sales manager who talked to someone at the factory and was told they would try to do it. Up until we walked in the door on Saturday, we still didn’t know if the table would be installed or not. We were very pleased to see that the table top was sent but no legs were installed and no holes were drilled for it. Once all the paperwork is done and the trailer is really ours, we will work with the service department to select and install a set of folding legs. We also want Camping World to install vent covers before we take delivery. There is time to get the work done since they will be storing the trailer for us until late March or early April. I will be writing a lot more about our new trailer in the future and I will have more details about just what features it has, what mods we make and what accessories we install. 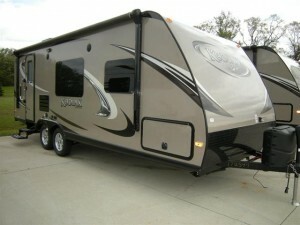 Heading to the Philly RV show this weekend. Looking for a motorhome with three slides, at least two up front to open the main living area. 46 days until we move the rig to Ocean City MD!! !